St David's Day, the 1st of March, is marked by the Welsh by the wearing of a daffodil. In my part of Scotland, the 1st of March is a bit early for daffs; but today they were in full bloom. They are everywhere on roadverges - a bright splash of colour to remind you that spring has definitely arrived. Driving along Great Western Road in Glasgow, or from the M90 into Dunfermline, long swathes of daffodils are planted in the central reservation; up Sinclair St in Helensburgh, on Argyll Terrace in Dumbarton... easy to plant and maintain, they seem to have become the favourite flower of council road maintenance departments. 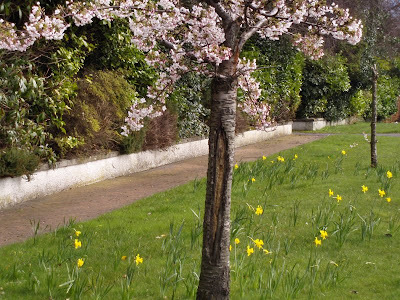 My favourite road of daffodils however is not passable by cars, but lies along the Fife Coastal Path in the estate between Aberdour and Burntisland. Now is the time to see this walk at its best. And the height of the daffodil season marks the start of another season - that of cherry blossom. Cherry blossoms are probably my favourite flower, and I was lucky to grow up in Helensburgh, where the avenues are lined with them. It's still too early for most of the blossom, and it will be another two to three weeks to see them in their full glory. 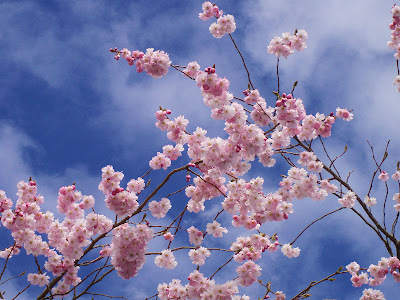 It is just a shame that the annual Cherry Blossom Festival no longer runs: ended, because the woman who ran it was unable to persuade enough volunteers to help her out. These colourful flowers celebrate spring, but soon give way to the monotonous greens of summer. Enjoy them while you can. It's still early in the year to be getting out on the water, but when the opportunity came to mess about on a boat I didn't hesitate. 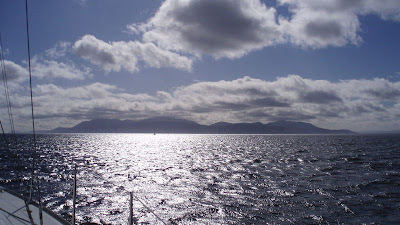 The Firth of Clyde is a beautiful area, island-studded, with the Highlands on one side; yet conveniently close to the Central Belt. This is the area of Neil Munro's much loved Para Handy, the fictional Edwardian puffer captain, whose stories can best be understood by getting out on the water yourself. 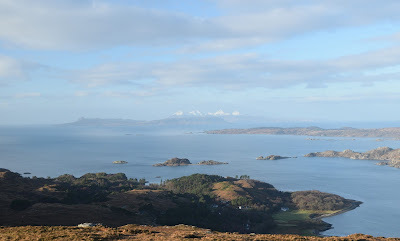 Tighnabruach, Rothesay, Millport, Greenock, Dunoon, Tarbet, Lochranza - far apart by road and ferry, yet easily accessible by boat. 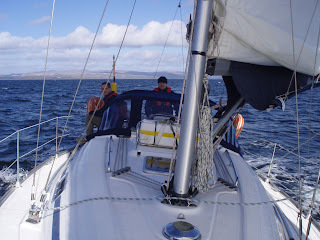 We sailed to Rothesay, round the Kyles of Bute, past Tighnabruach (the smell of peatsmoke wafting out to us), towards Lochranza, back round Cumbrae to Largs, and saw several types of seabirds, rainbows in the waves, and a dolphin. The Firth of Clyde - all islands, sealochs and quaint seaside towns - is full of character, and is a fairly safe cruising ground. Sheltered from the worst swells by Kintyre, and with a low tidal range, you can run in most directions for a good harbour. 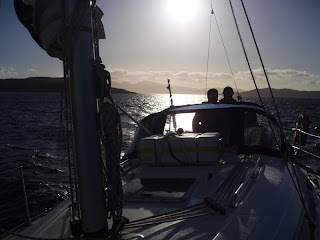 Yet on the other side of Kintyre - accessible by the short Crinan Canal - is the Firth of Lorn. This has some of the most challenging cruising waters in the world, with fast tidal races, reefs, and the infamous whirlpool of Corryvreckan. I think I want a boat. Part of the pleasure of attending a sporting event - rather than just watching it on television - is the atmosphere generated by the crowd. Unfortunately, as I discovered yesterday at the Scotland v Ireland Six Nations match, one does not get atmosphere at Murrayfield - at least, nothing to compare to any football ground in the country. I bemoaned this, but my companion put me right. "There's an Irish boy to the left of you - why would you want to boo his team?" I looked around me and, apart from the occasional lone cry of "come on Scotland!" the vast crowd sat silently. Where was the fun in this? Yet the lack of passion demonstrated by rugby fans is, paradoxically, one of the sport's strengths. Because rugby supporters are well behaved, there is no segregation of fans. Unlike at football, alcohol is served at the ground, yet there is minimal police presence outside the ground. The good behaviour and lack of an intimidating atmosphere means there are far more women supporters at Murrayfield than at the likes of Hampden, and parents can take their children knowing they won't be exposed to screaming, abuse, or terracing wit. Perhaps because rugby players are often big fellows who bang into each other on the pitch, and carry the scars of it, they understand the consequences of aggro and violence; and where football thrives on tribalism and division, rugby fans share a common bond of respect. But although I enjoy the company of rugby fans - and I prefer playing touch rugby to football - if I've paid a great deal of money to attend a sporting event, I expect to be able to shout myself hoarse in the company of thousands of other like-minded 90-minute extremists. I don't think I will return to mild-mannered Murrayfield for a while.